UTS Volleyball will be holding it’s open trials for guys and girls looking to play in the State Cups & Sydney Volleyball League representative competitions in 2013 in the next 2 weeks. Women are Saturday 2nd March 2.30pm – 5pm and Tuesday 5th March 7-9.30pm. 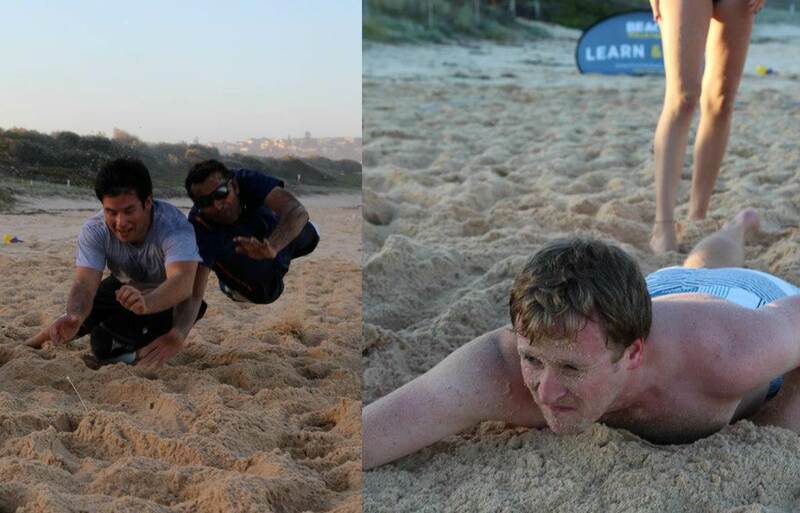 Preseason training for players intending to play with UTS for Sydney Volleyball League in 2013 started last week at South Maroubra, with 3 more sessions on the beach to go before we go back indoors. Nam ran a smallish group of 15-20 through some group fitness and some general beach activities. The fun really started with some beach flag competition. The competitive spirit was nearly as high as the waves on the beach. Apparently though, when lifesavers do beach flags they don’t have the additional challenge of beach volleyball court lines being on the sand… which made the final 2 battle of the boys between Nick & Gino a little anti-climactic. Information on the remaining 3 sessions can be found in the UTS Volleyball Club Facebook Group. The 2013 UTS Volleyball Australia Day BBQ, cricket and grass volleyball get together was held on 26th January, with about 30 club members and significant others dropping in during the day. We had a beautiful hot day for the event with lots of sunshine, some outstandingly well cooked sausages, music, numerous ice filled eskys to keep our drinks and foodstuffs cold, plenty of blankets and camp chairs for everyone to lounge around on, as well as a small marquee to throw some shade. The guys and girls, and even the kids (just try and stop Wolfie!) all got into some cricket at various points through the day. Our Russian dynamo Artem provided real proof that even with great physical talents, cricket really isn’t part of life everywhere in the world. Thankfully, the standard was not so high as to make this noticeable. 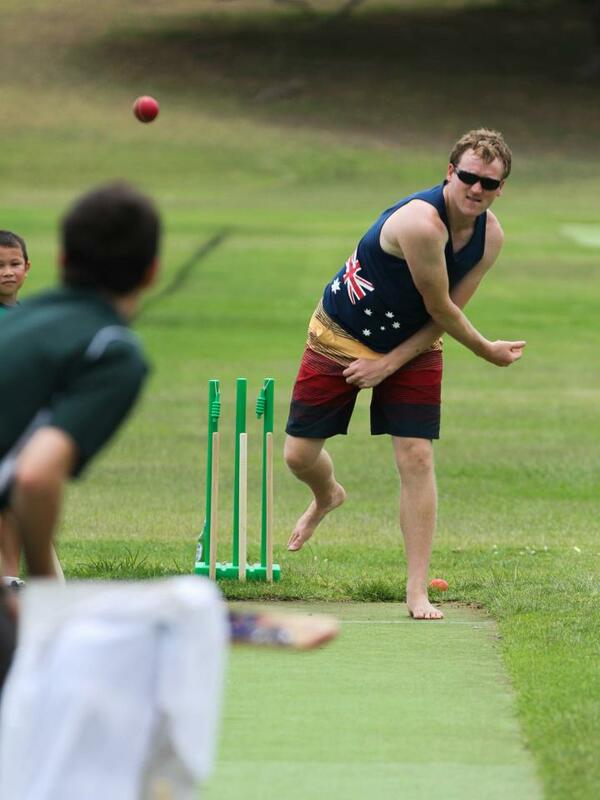 Our Scotsman’s unique bowling style even found a way through someone’s defenses at one point – talk about embarrassing. Some BBQ sausages on bread with sauce for lunch was followed by some serious grass volleyball. The combination of 2vs2, 3vs3, 4vs4 and 6vs6 played through the day showed us all just how long ago most of us touched a volleyball. The style was there for all to see though. You only have to look at Nam’s preparation to play defense below. Some more cricket and volleyball, and even some frisbee, leftover sausages and plenty of cold fluids finished off a great day for all. Thanks to the social committee for their work on this one and to everyone who turned up. The next event is loosely scheduled for 23rd March. Keep your eyes on the Facebook group to find out more. You are currently browsing the UTSVC blog archives for February, 2013.